There are 2 posts tagged the big word (this is page 1 of 1). Outsourcing or One Stop Shops. Words that strike fear into the heart of the Sign Language Interpreter. A word that means the work that they previously did direct or though one agency for a council, a hospital or a court now has to go through a larger spoken language agency. Spoken language agency will not understand how to source a BSL interpreter and will sub-contract a specialist agency. They will think they can pay BSL interpreter the same as a spoken language interpreter and when they start the contract will get a big shock. Specialist BSL agency eventually agrees to reduced price sub-contract as all previous work they did is now being outsourced to spoken language agencies who have little understanding of deaf people and BSL interpreters. Specialist BSL agency still wants to survive in market where they get less work. BSL agency asks BSL interpreter to work for less fees. BSL interpreter, if accepting fees, finds they are working for a lot less than before. BSL interpreter is then providing profit for two separate contracts. BSL interpreter considers leaving the profession as they can not survive as an interpreter and must consider another career. Deaf people get less experienced and maybe unregistered interpreters as a result. Time for a real life example… One of the biggest culprits is Language Empire and Remark Interpreting. Language Empire has a contract to provide interpreting for ATOS. ATOS has the contract for the Government’s Department of Work and Pensions medical assessments. ATOS carry out assessments to decide if the claimant should be allowed incapacity benefit or if they are fit to work. There are problems for disabled people in general with these assessments. MPs themselves have stated the assessments are flawed. The ATOS machine rumbles on… so who do they employ to do the interpreting? Language Empire. An agency who is so ignorant of BSL it calls it British Special Language. The images of hands on its ‘BSL’ page are not of any recognisable signs and they state they have ‘special disability interpreters’. Nobody actually knows what this means. Their webpage has caused BSL interpreters much mirth but complete dismay at their ignorance. The worst is yet to come. A deaf-led agency has now started to sub-contract for Language Empire. At least the RNID (now Action on Hearing Loss) when sub-contracting for The Big Word stood up for BSL interpreters and helped The Big Word understand the BSL interpreting profession. This organisation has done nothing for interpreters or the deaf community it proposes to serve. They continue to try to source BSL interpreters at greatly reduced cost for what it’s contractors call British Special Language. This particular agency states one of their aims as supporting and enhancing the lives of Deaf, hard of hearing and blind individuals.’ I don’t think so. Meanwhile we hear of regular reports of yet another council, organisation or government department outsourcing or looking for a ‘one stop shop’. When the agency is not reputable, the cost to the organisation generally remains the same but the quality drops off. With BSL usually representing something around 2% of a contract, the interpreter or deaf person loses out. What used to cost an organisation £100 – £160 per booking average direct, now costs the same or worse (Freedom of Information requests by interpreters show this to be the case due to sub-contracting). The fact costs have barely been saved is not important. It’s the ramifications to the profession and subsequently deaf people that matters. Spoken language agencies generally do not understand the NRCPD registration system for sign language interpreters. These agencies are more likely to employ someone with level 1 or 2 in sign language (equivalent to a GCSE or A Level in French) thinking this is acceptable. It may be if we were native BSL users but as interpreters, by the nature of the job, we are mostly people that can hear, and we tend to have English as our first language. Therefore, most people with a basic qualification in BSL do not have enough fluency to interpret anything but someone buying a cup of coffee much less a medical appointment. Would you try to interpret consent for an operation to a French man if you had GCSE French? 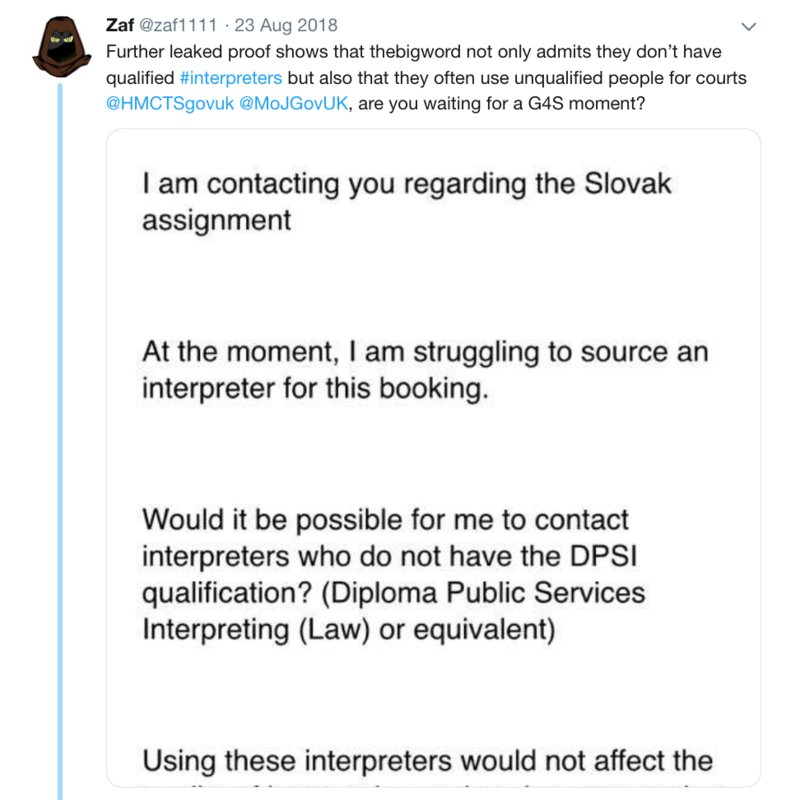 Every qualified registered interpreter has been to an appointment where the deaf person said but that’s not what the interpreter said last week. Take the case recently of an elderly deaf man who thought he was having a minor operation on his shoulder. The hospital had provided an ‘interpreter’ the week before to sign the consent forms. When the registered interpreter arrived a week later the patient was shocked to discover he would be having a a major operation that day under general anaesthetic. What will it take to stop this… A malpractice lawsuit? A death? Rumour has it that already happened but unless someone actually does anything about it, the government outsourcing machine continues, the big agencies profit and deaf people lose out.